Let your imagination guide your guests as they travel to far away lands. 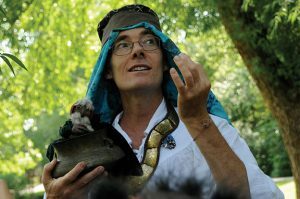 Renaissance Adventures storytellers weave together magical, mythical characters from exciting places into the hearts of the partygoers. During the story, volunteers may don costumes and assist the storyteller by acting out characters, or interact with the storyteller by offering suggestions and ideas to solve dilemmas. We are versed in many stories, and it may be possible to provide a story that mirrors the theme of your party. A great activity for children ages 5 and up; storytelling is a good solution for a group of highly diverse ages, and is definitely enjoyed by adults. Add interactive actors to your themed event, and customize with scripts, challenges, and/or other ideas. We have joined galas, festivals, and school events and can work with you to make your special event come alive! 30 minute storytelling/theater performance: $120, no group limit. Cost to add a storytelling performance to a Sword Skirmish option is $80.